Can you escape our Lone Star room? Ready for a fun challenge that you won’t soon forget? Located in the heart of Houston’s Midtown District, The Escape Hunt Experience is Houston’s Premier Escape Room and offers a true “experience” where you are transported to another era or place. You and your team are locked in a themed room where you work together to find hidden clues and codes and solve puzzles in order to get out of the room in under 60 minutes. In Theft of the Texas Lone Star, you are detectives who are trying to recover a famous museum artifact before the museum opens. The moment you walk through our front door, the experience starts as you are transported into the study of Sherlock Holmes, complete with period furniture, a fireplace, copper ceiling and chandelier. We are centrally located in the Midtown District, known for its many fine restaurants, eating options and fun bars. Please plan to arrive 15 minutes before your scheduled start time. We provide complementary parking in our parking structure, so no worries on what to do with your “wheels” while you enjoy your time with us. In our Theft of the Texas Lone Star you are detectives. The museum exhibit of the first president of the Texas Republic, Sam Houston, has been broken into by thieves. The original Texas Lone Star artifact created in 1836 has been stolen and is to be sold on the black market. The search has twists and turns as you experience a bit of Houston. You have one hour to recover the Lone Star before the museum exhibit opens. Can you recover the artifact and escape the room in time?! 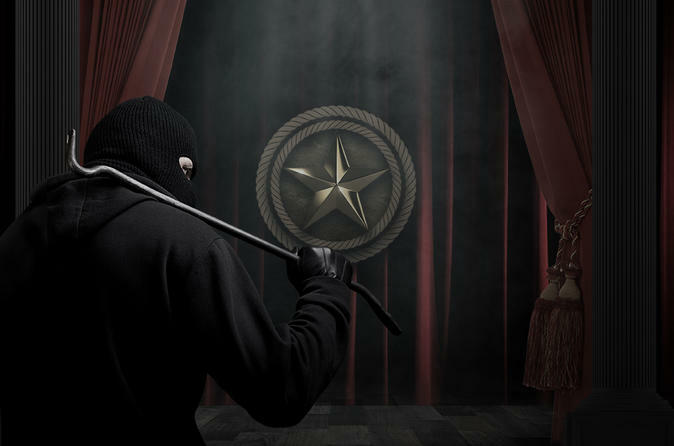 We offer four separate Theft of the Texas Lone Star escape rooms, so larger groups can break into teams and play a fun head-to-head competition.